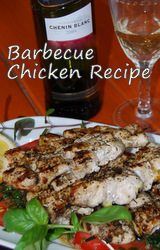 Here's a barbecue chicken recipe that'll have you thinking about romantic dinners in exotic places. The aromas of the BBQ chicken cooking over charcoal or even on a normal grill are absolutely wonderful. Warm spices and lemon combine to make a truely memorable experience. We like to use preserved lemons that we do ourselves, but if you can't get them, grated lemon zest works very well. A great recipe for your own Mediterranean diet. This great recipe qualifies for our healthy living seal of approval. Fresh - skinless chicken meat (use organic if you can) vegetables and health giving Spices. Marinate your chicken pieces well in advance and don't make your heat too fierce - the flavours are quite subtle. 1-1/2lb/675g. of chicken breast cut into 1"/2.5cm. cubes. 8 - 8"/20cm. wooden bbq skewers. 1 Onion cut into 1" sections. Skin of one preserved lemon - cut into 1/4" squares - or the zest of one lemon. 4 tbs. Good quality olive oil. 2 Plump cloves of garlic - bashed and chopped. 2 tsps. toasted cumin seeds - ground. A pinch of star anise. Chopped fresh herbs - we used rosemary, mint and coriander. 1/2 A lemon - juice of. Grate the zest and use as well, if you are not using preserved lemon. Put the chicken and all the marinade ingredients into a glass bowl - at least one hour before you want to cook. If you're using an open fire soak the skewers in cold water to prevent them burning. Now - when you're ready to cook, thread the chicken onto the skewers - first a chicken piece, then a piece of onion and then a piece of preserved lemon. You should get about 5 pieces of chicken on each skewer. Grill or Barbecue your kebabs until they're nicely browned and cooked through. Serve with a crispy baked potato, some tomato salsa and a lovely glass of wine. Cheers!